Timothy Williams, Herbert Schraufnagel, Michael Spain, Christopher Morgan, Karon Jackson and Julia Darden, all with Emory University Hospital Midtown Public Safety. 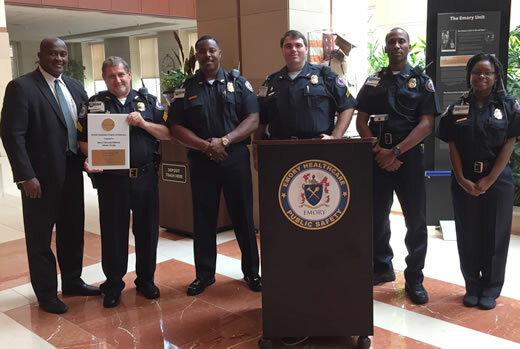 Emory University Hospital Midtown’s Public Safety Department has been awarded a Program of Distinction by the International Association for Healthcare Security and Safety (IAHSS). Emory University Hospital Midtown is only one of two hospitals in the state of Georgia, and one of 53 in the U.S. and Canada, to achieve this recognition. With more than 2,000 members who are health care security, law enforcement, safety and emergency management leaders, the IAHSS is the only organization dedicated to professionals involved in managing and directing security and safety programs in health care facilities. Hospitals qualify for the Program of Distinction by achieving and maintaining a minimum level of certified officers, managers and directors within their security department. "We are very proud and honored to be recognized by the International Association for Healthcare Security and Safety, the premier organization for health care safety and security programs," says Timothy Williams, director of Public Safety, Emory University Hospital Midtown. "Our team is dedicated to keeping patients, staff, physicians and visitors safe while they are in our facilities throughout our Midtown campus." Other requirements for the program include: 70 percent of the security officers must be continuously certified through the IAHSS Progressive Certification Program and maintain either a IAHSS Basic, Advanced or Supervisor certification; and the director of the security department must maintain a current Certified Healthcare Protection Administrator certification. "Our public safety team works diligently around the clock to provide a safe, secure and welcoming environment for everyone who comes into our hospital," says Daniel Owens, CEO of Emory University Hospital Midtown. "Not only do they excel in their profession, but the team has gone above and beyond to become certified and achieve this special recognition." The IAHSS Program of Distinction is valid for two years, then renewal is required.